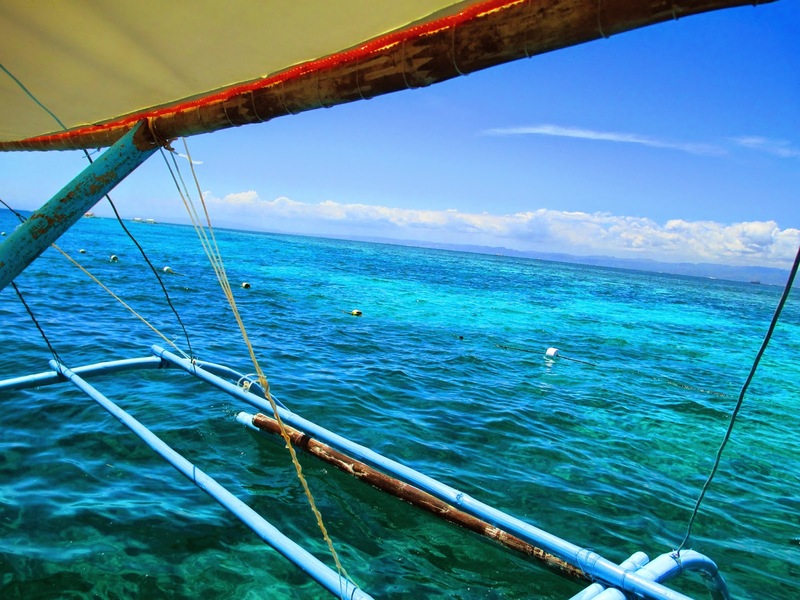 The Philippines are composed of 7,000 islands, so planning my trip was no easy feat. It was hard to get started. 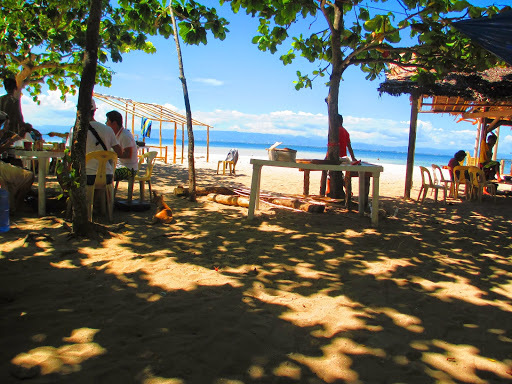 After careful research, and a lot of blog-reading, I chose a tiny “resort” on the lesser-known island of Olango, near Cebu City. “Resort” in this case meant there was a restaurant on site. Getting to the island from Cebu’s tiny airport required a quick taxi ride through the city and then a private 30-minute boat ride from the dock. My home for three days was Talima Beach Resort. The place itself was very quaint and simple, but the natural tropical beauty added several bonus points. 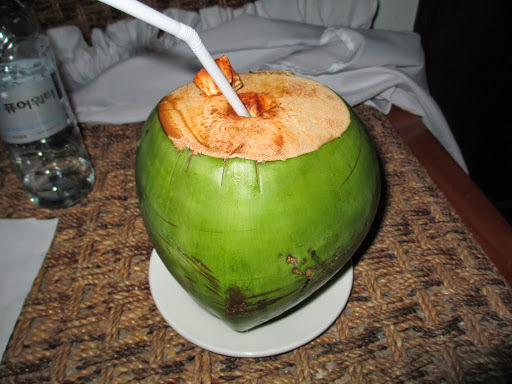 I was greeted with a fresh coconut. Left: Talima’s restaurant and lounging huts; Right: the resort pool and bar. My humble room complete with a mosquito-netted bed, and my personal patio on the right. A local restaurant where sitting at a table costs extra. I hopped on and held on for dear life as I caught my first glimpses of life in a third world country. When you zoom past emaciated dogs, watch shoeless children play in the dirt, and buy sunscreen from a teenager balancing a newborn on her hip, all before heading back to your vacation resort, you can’t help but feel a little guilty. However, something that kept the guilt at bay was noticing how content the people of Olango seemed to be. Everyone wore a small smile, locals joked and laughed with each other (regardless of their relationship) and contrary to people in Seoul, no one was in a rush to get the day over with. For me, it was the epitome of an escape from the daily grind I was used to. My choice of views for book-reading and lounging. My second day was by far the best day. I had signed up for an island-hopping boat tour, which until I boarded the boat, didn’t realize was completely private. I had reserved the whole boat to myself. Only the captains were my company. Before you think I’m actually a princess, I should explain the currency in the Philippines. One Philippine Peso is equal to about two American cents. 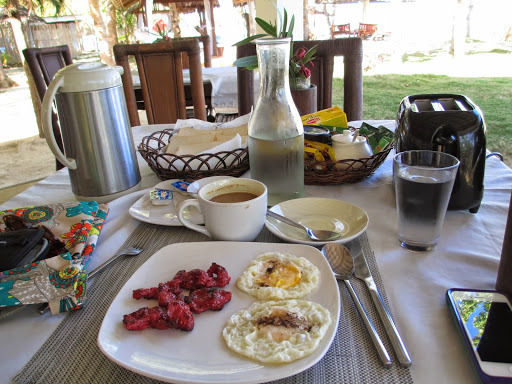 To give you an idea of the price of an Olango beach resort, my meals were never more than $7, which is “expensive” by most Filipino standards. Get the gist? Back to the boat tour: the co-captains were Keven and Armand (18 and 25 years old respectively). Also joining the crew was 10-year-old stowaway, Jordan. Jordan was a stranger to Keven and Armand; just a kid skipping school en lieu of a boat ride. Armand and Jordan were both the silent types, speaking very little English and occasionally conversing in their native language of Tagalog, which sounds a lot like Spanish (Spanish was the official language of the Philippines for centuries until the 1900s). Keven, however, spoke enough English to have simple conversations with. Keven peeling a whole lobster for lunch. Keven and I shared one of those rare immediate bonds, where I felt inexplicably comfortable being at the mercy of a complete stranger in the middle of the ocean. I thought of him as a brotherly friend right away. While many Filipino people perceived my tourist status to mean I was privileged and filthy rich (I got asked my yearly salary more than once), Keven saw me as a portal to the world outside of Olango. He was so curious about my life and more than happy to teach me about his. The colors of the water were breathtaking. What surprised me during our boat tour were the “pirates.” Not the sword-wielding, eye patch-wearing kind, the kind who boards your boat and engages in awkward small talk until you realize they’re waiting for money. Sometimes they’re selling seashells or jewelry and sometimes they’re offering to take you for a ride in their makeshift paddleboat. It only took two pirates before Keven and Armand started fending them off from afar, for my benefit. I say “fending”, but they were probably just warning them not to waste their time. Either way, I was grateful. Taking a swimming break with Jordan. guards. It took some convincing, but I got them to stop calling me “ma’am” and call me by name. By the second island, I persuaded them to join me in the water. Even little Jordan was surprised at my offer and looked to the captains for permission. Based on their hesitations, I’m going to guess they’ve never before socialized with guests of the resort. 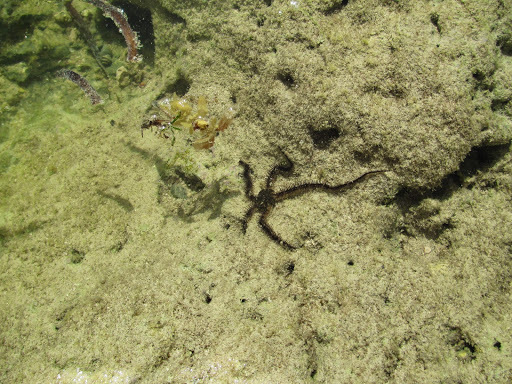 We all tried something new that day: I fearlessly swam in the clearest ocean water I’ve ever seen, among hundreds of tropical fish that somehow never touched me despite their proximity. Keven dove deep for starfish and Jordan did cannonballs off the boat. Armand watched in amused silence while smoking cigarettes. In a weird way, it all felt so normal. Keven diving and Jordan retrieving starfish. On the way back to Olango, the boat got stranded at low tide. 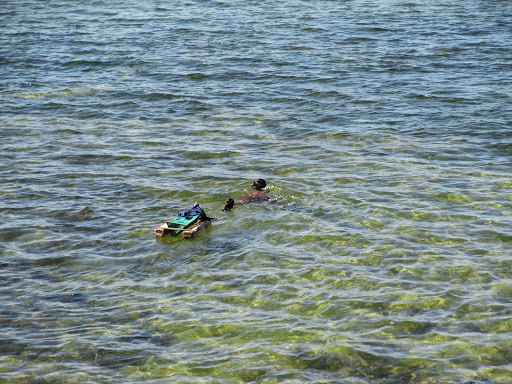 All three boys jumped out to push the boat through the sand back to deep water. Without thinking, I joined them in the water to help. The sea was up to my knees, but you would have thought I was drowning with the amount of yelling that followed. They were mortified at my attempt to help push. Keven explained the risk of stepping on sea urchins and insisted I sit in the cockpit while they push the boat free, otherwise we’d have to wait an hour for high tide. If you know me, you won’t be surprised to hear I followed his advice for about five minutes before sneaking off the back and pushing from behind. Growing up with brothers has ingrained a need for keeping up with the boys. When they noticed, we all laughed a bit and I stubbornly said, “If I can’t push, then no one can.” So no one pushed. 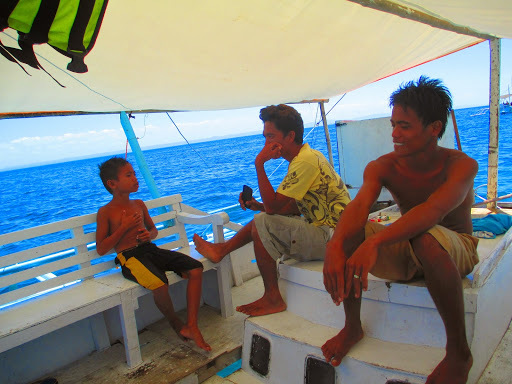 We relaxed on the boat until high tide, drinking water, listening to music, Jordan showing off his Tagalog rapping skills. It’s hard to explain the feeling I had in that moment, stuck at low tide, on a boat with people I’d met only hours prior, but I can tell you this: it’s the reason I travel. 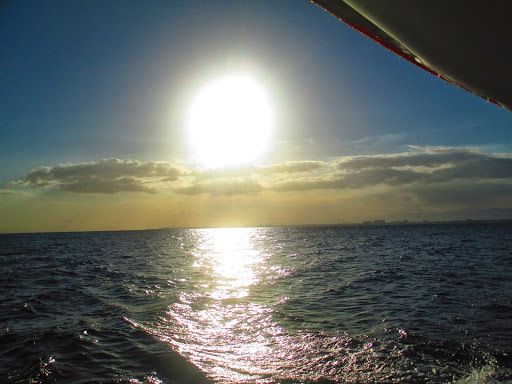 That evening I dined on traditional Filipino Chicken Adobo while I thought about the quick glimpses into Filipino culture I’d perceived that day on the boat. My entire life I’ve only thought of a place like Olango as a vacation destination, never a place where people are born and grow up. It somewhat baffled me that in a place like Olango, where even fresh water is scarce, no one really seemed worried or upset about their meager (to me) living conditions. When I asked a few of the locals how they liked living on Olango, they answered with a slight indifferent “sure”, but no one ever answered in the negative. I asked one man why he liked it, and he said, “It’s the most beautiful place in the world.” A bold statement from someone who’s never left the island. Olango locals see this view every day. I was a little envious of Keven’s and Armand’s indifference of uncertainty, but then again, I don’t think they really have much choice due to poor currency, lack of resources, etc. I wondered if all those things changed and they suddenly had more opportunities, would they choose to take them? That got me thinking about Jordan, our 10-year-old stowaway. 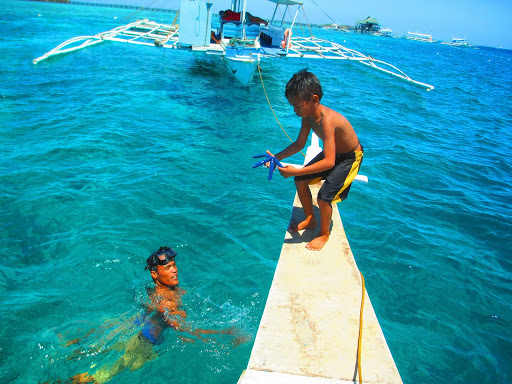 He skipped school to spend a day on a boat, playing with fish in the water, catching one as a pet. He’s probably never heard of video games or the Disney channel, but if it was available, would he still choose the boat? A young Olango boy searching for shells and food. In my eyes, the people of Olango envelop the idea we (in the first worlds) all strive to achieve which is being happy with what you already have. Instead, we focus on the things we don’t have. We’re either constantly working to obtain our next goal, or accepting what we’re “stuck with.” Within less than three days on the island, I felt ashamed at the amount of material possessions I owned, and how many of them had taken priority in my life over the intangible. In fact, right there at my finished plate of Chicken Adobo, I began to scheme a way to stay on the island long-term. I considered working at the resort, tutoring English, joining the pirates. Part of me was terrified I’d never figure out how to live an unhurried, worry-free, non-materialistic, satisfied life unless I lived on Olango. Another part wanted to stay and discover in what ways the people of Olango were unsatisfied, worrisome, or materialistic. Are these traits simply human-nature, or products of our cultures? 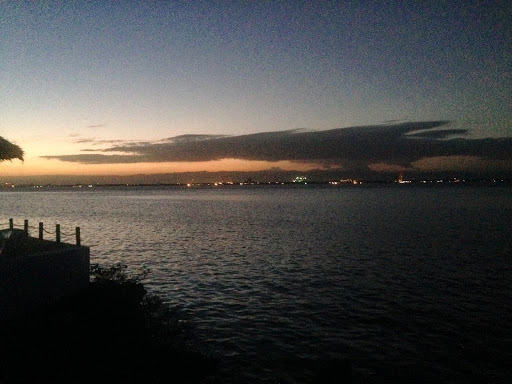 Talima’s view at sunset; the lights of Cebu City in the distance. My last day on the island was spent much like the first: book reading, pool dipping, fish eating. A company from Cebu City was having a staff gathering at Talima, so for the first time during my stay, the resort was pretty busy. By busy I mean loud and entertaining; the staff still carried their laid back, content demeanor. To get a break from the noise, I decided to explore the ocean at low tide with Keven and Armand. Since it was winter, the water was already at a lower level than usual, so at low tide, the whole ocean floor about three feet from shore was visible for a couple hours a day. There is so much to see! Growing up far away from the ocean, I assumed touching anything would result in a sting or a trip to the hospital. Keven and Armand, however, were experts in ocean floor dwellers. They fearlessly scooped up everything to give me a closer look while pointing out the few things I shouldn’t touch. While most of what Keven showed me in the ocean was deemed “good for grill”, I took the whole low tide expedition as a much more meaningful metaphor. (Surprised?) 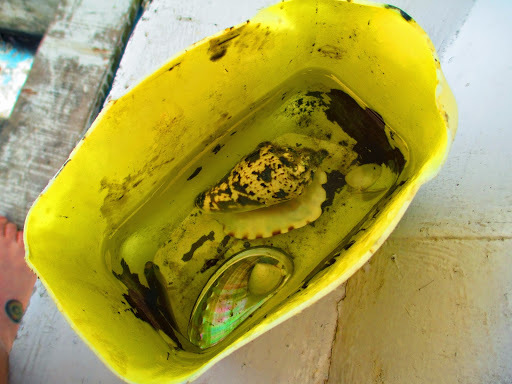 When the ocean is at high tide, it’s easy to forget all the life, giant and miniscule, that exists because I can’t see it. Even at low tide, it’s easy to miss the motionless creatures, but I start to realize they’re there. Sometimes it takes someone else, like Keven, to point it out and show it up close. It hit me that staying on Olango wouldn’t magically give me the key to a satisfied life. As an outsider, I had been looking at Olango locals the way I looked at the ocean at high tide: on the surface. To me, they seemed completely satisfied with their lives, but if I scratched the ocean floor, I would most likely learn of their worries or discontent. Even if I didn’t, I could never achieve satisfaction by trying to live someone else’s way of life. One person’s dream life could be another’s nightmare. I’ve decided that there is no single key to happiness for me; my keys are dispersed around the world amidst places, people, and things. As long as I’m exploring, discovering, and learning, I’m happy. As I said before, this is why I travel. 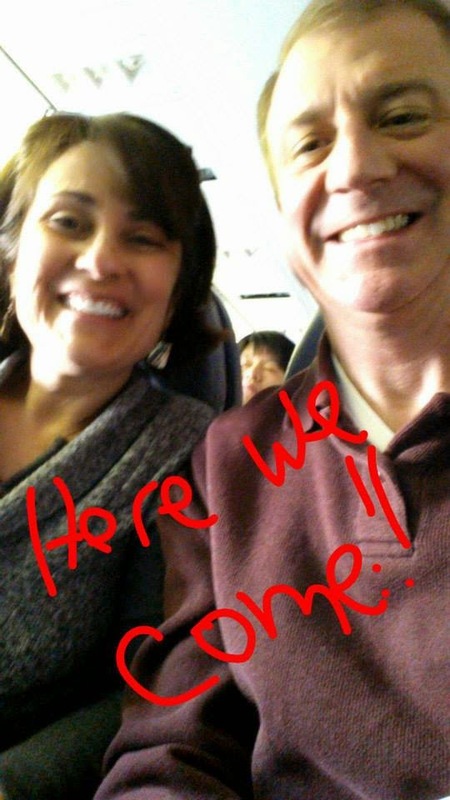 Mom and Dad on the plane. As an expat living in a country as different and far from my home as Korea is, nothing is more comforting than having visitors. Especially when those visitors are your one and only parents! 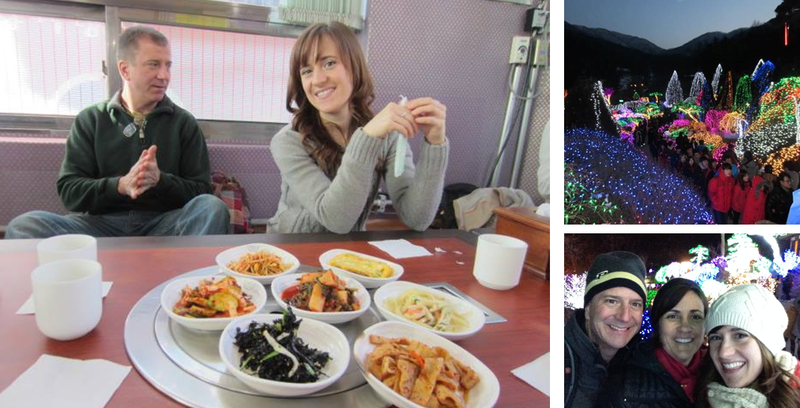 My adventurous side doesn’t come from nowhere, so I couldn’t wait to introduce my mom and dad to Korean life. Taking after my organized mother, I did a ton of research and composed a very detailed itinerary for their 11 days with me in February. 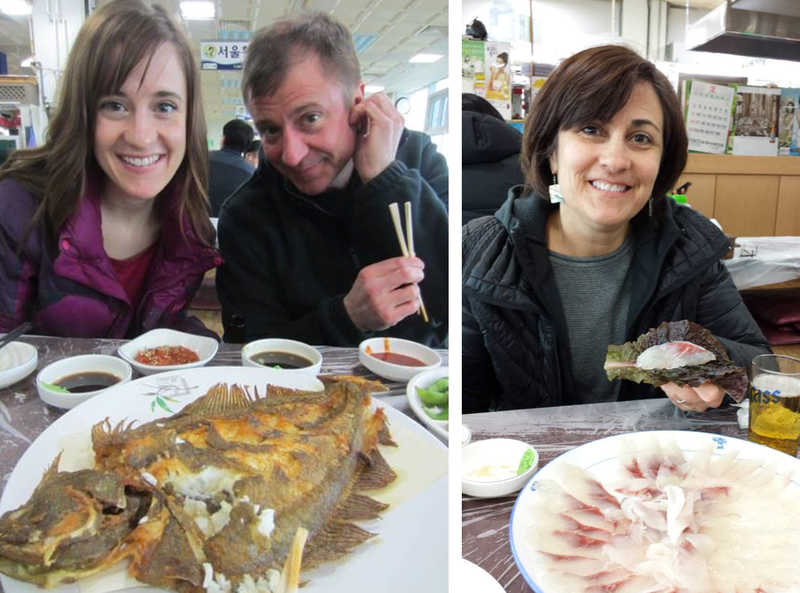 I had planned a lot of sightseeing in the most popular destinations around Seoul and Busan, but what I was most excited to share with my parents was traditional Korean food. During their visit there was no risk of us going hungry. I made sure to hit everything I already knew and then explore some new cuisine I’d never tried before. We ate a lot. Rather than make this post a complete diary of the trip, I’ve narrowed my parents’ visit down to my favorite food and culture escapades. Scenic hike to the remote temple. 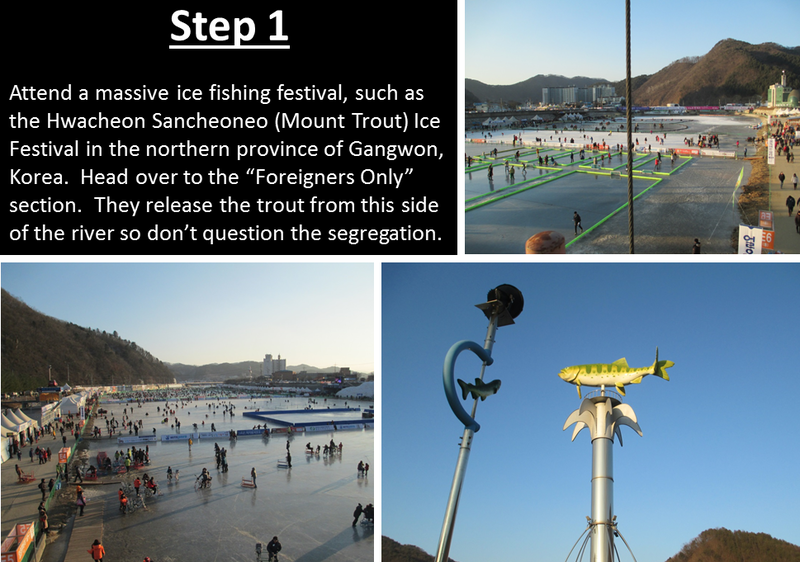 Chuncheon (pronounced choon-chun) is a small city about two hours north of Seoul by train. We took a day trip here in order to visit one of Korea’s more remote temples, Cheongpyeong Temple. 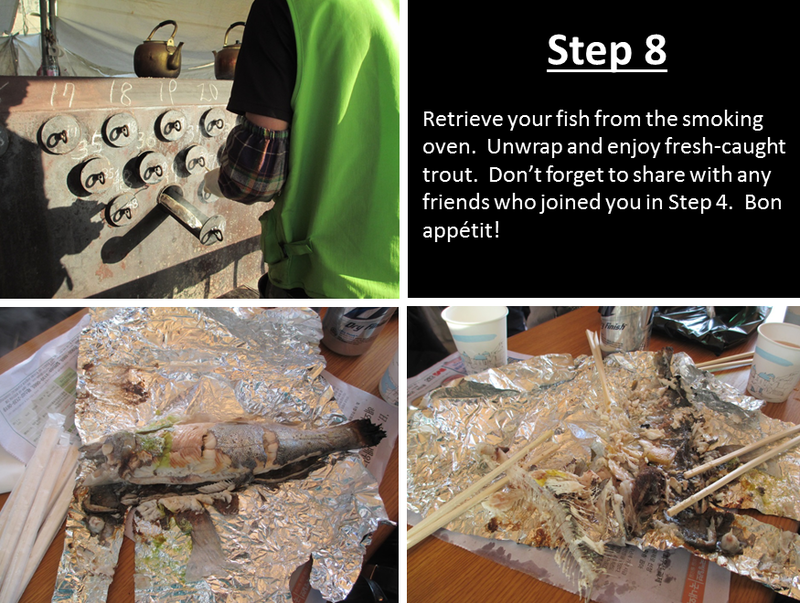 Along the way, we were told to try the wintertime specialty of “ice fish” tempura. Even though we’d had our fair share of Japanese tempura, this wasn’t exactly what we were expecting. 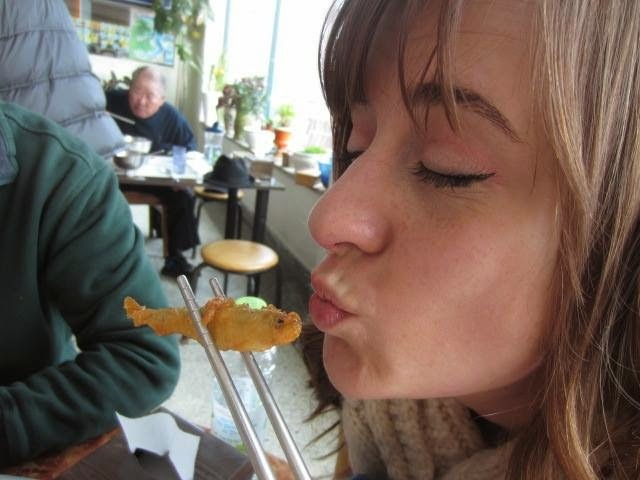 When we entered the simple restaurant, we saw many large tanks of “ice fish” which we soon realized were tiny smelt. 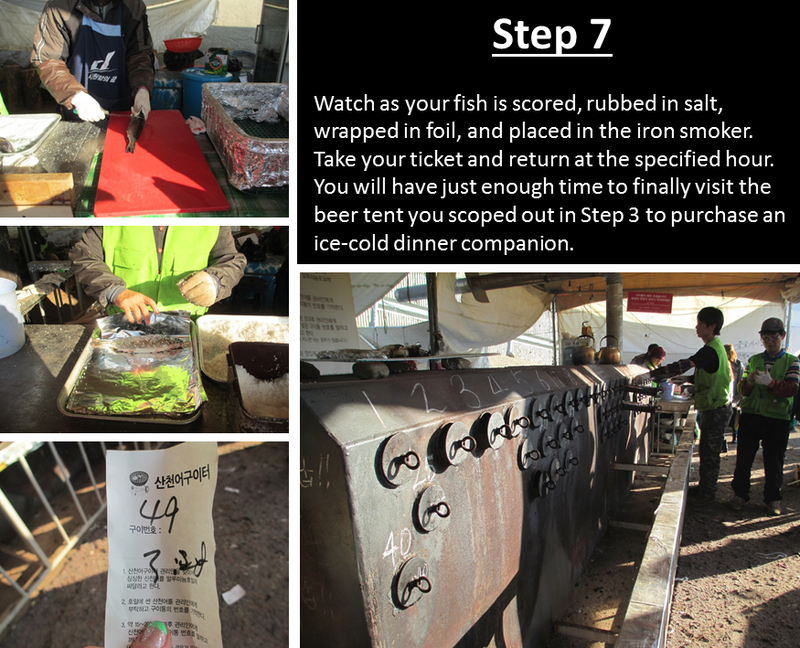 Immediately after sitting down, we learned of the locals’ favorite smelt preparation: raw. Not sushi raw. Raw as in: “Here’s your bowl of live, swimming fish and some chopsticks. 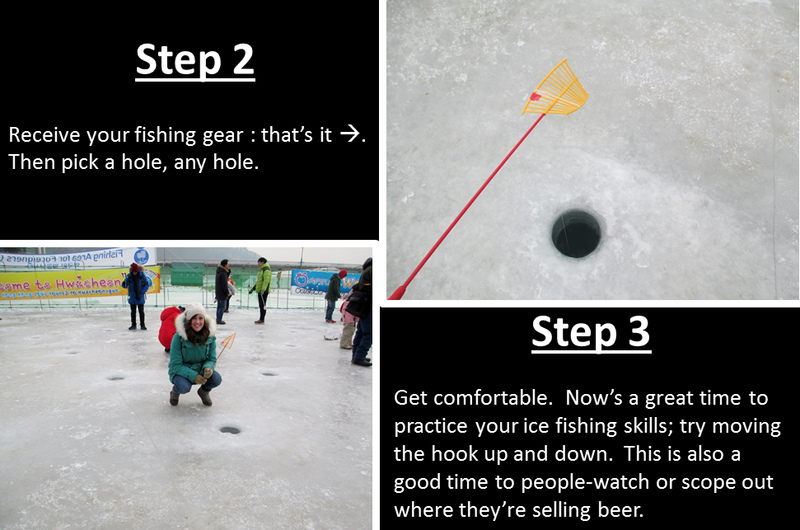 Good luck.” We watched in shock as Koreans struggled to contain their active fish bowls (picture a lot of splashing and escaping fish). While some diners seemed a little amused with their lively meals, most were unperturbed and hungrily speared (mad chopstick skills), dipped in spicy sauce, and swallowed. Not wanting to disrespect our hosts who were anxiously awaiting our order, I did some frantic translating of the menu to figure out which of the items was the battered and deep-fried tempura fish we were looking for. With about 80% certainty, we placed our order and were more than relieved when our dead, golden fishies arrived. The fish were small enough to just pop in your mouth. The texture of their tiny bones and fins is a little surprising, but I found them quite enjoyable. The bigger, the better! One of the few times Mom asked me to play with my food. Dad looking skeptical at being served raw food. When our server tells us it’s ready, we dig in. The chicken is so perfect! It’s on the verge of my spice threshold, but too tasty to notice. It’s reminiscent of a sweet BBQ sauce swirled with Sriracha. The rice cakes are crispy on the outside, chewy on the inside. The cabbage still crunches. Incredible! When we’ve almost finished the contents in the pot, we choose to add rice noodles to stir fry with the leftovers. I’m so full, but the crispy rice noodles and spicy remnants are too good to ignore. It’s the happiest I’ve ever been with a runny nose and prickling tongue. The before and after of our spicy meal. We killed it. The market is split into two sections: indoor (left) and outdoor (right). A popular destination for Korean businessmen during lunch, we decided to settle in for some of the freshest fish in our lives. Based on what we saw on other tables, we ordered some sushi, boiled prawns, and baked flounder. Mom wrapping sushi in lettuce leaves to dip in sauce. Nothing is wasted at Jagalchi, so the head, tail, and other sushi-unworthy bits of our raw fish were simmered in a tasty stew and served as our final course. The texture of the raw fish was a bit more than we could handle, so we dipped our leftover sushi in the boiling soup fondue style. And now we are forever ruined in the department of fresh fish. It will be hard to beat. Left to right: My family enjoying our fresh fish; the hard-working chefs in their tiny kitchen. One of many narrow alleyways of Gamcheon. 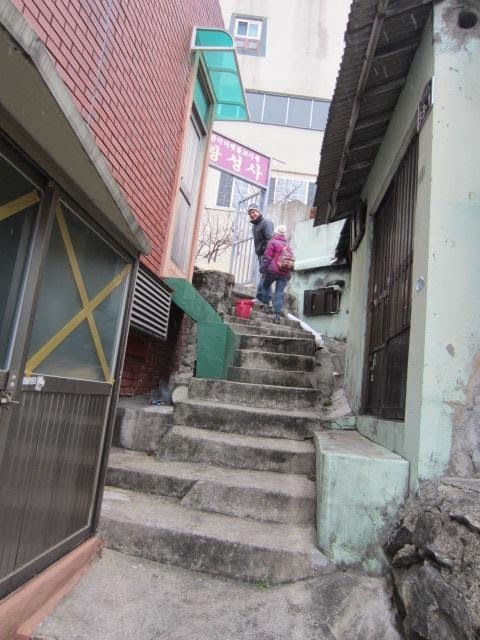 We wandered up and down the steep and narrow alleys of the Gamcheon until stumbling upon the “Happy Village.” Unbeknownst to us, the modern-looking building acted as a cultural welcoming center for immigrants to Korea from around Asia. We were the first Americans to enter the place and we were treated like royalty. 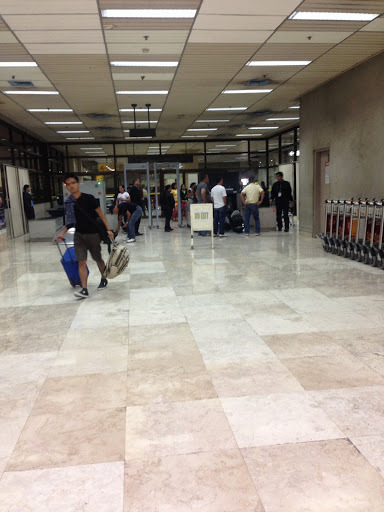 We were quickly ushered in and invited to sit down by a more-than-thrilled Korean woman. She frantically started preparing coffee while yelling to someone upstairs. When a young Filipino woman clad in sweats and rubber gloves entered the room, she was as surprised as we were that the five of us were all in the same place at that moment. They wanted to know everything about us as we politely sipped our espressos. The Filipino woman acted as translator. They giddily asked us for photos and comfortably squeezed in next to us. They even offered us a ride to our next destination. I think I got a tiny dose of life as a celebrity. Our interaction was hurried and a little awkward, but the three of us left there with giant smiles on our faces, surprised at the unexpected camaraderie of complete strangers. The two women took turns snapping photos of us together. The woman on the lef twas the Korean owner and our thrilled host of “Happy Village and the woman donning the pink hat on the right was our English translator. 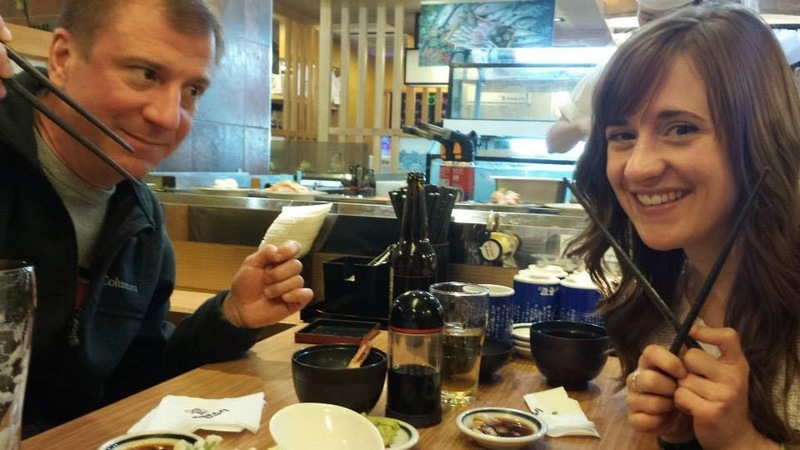 I took my parents to the now infamous neighborhood of Gangnam (thanks, Psy) one night for some authentic Korean BBQ. 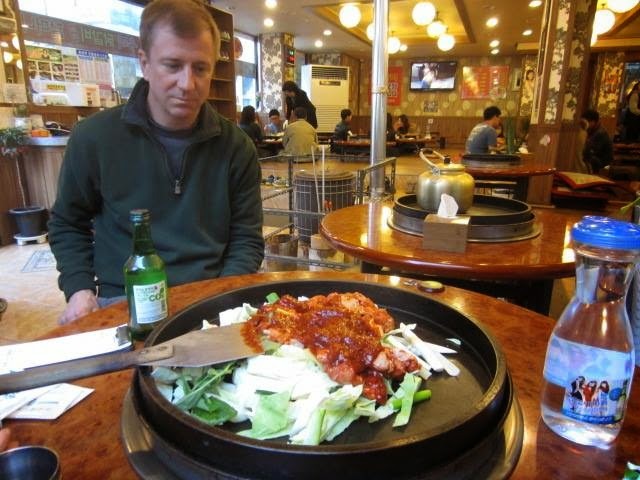 As with most of the popular neighborhoods in Seoul, Gangnam is nowhere short of Korean BBQ restaurants. They’re all pretty similar; my rule of thumb requires a vent above the table to draw in the smoke from the grill. The BBQ grill (and vent) is surrounded by side dishes. Korean BBQ in Korea is fantastic. You get so much food at a price that makes you think you’re cheating the system. In typical Korean restaurant form, we ordered everything right away: a few portions of raw beef and pork, rice, beer, and soju (Korean liquor). Everything else on the table (side dishes, salad, dipping sauce) is included. If you’re competent at the grill, the servers leave you alone for the rest of the meal. If you’re slacking, they wordlessly help you out from time to time. A familiar sign around Seoul: norebang. Korean BBQ restaurants always embody a fun atmosphere, the guests’ intents being to share a delicious meal and drink to the heart’s content. Soju and beer flows freely here, especially in an area high in nightlife like Gangnam, where the night is bound to continue a few rounds after dinner. In order to give my parents a dose of said nightlife, I took them to a norebang (pronounce “no-ray-bong”), a private singing room. It’s like karaoke, but you share a room with only a small number of friends you’re willing to embarrass yourself in front of. So. Much. FUN!!!! Mom rocking out to Billy Joel on the left; Mom secretly recording me singing Hanson’s “Mmmbop” on the right. Watch it here. A table filled with glorious side dishes called panchan. guests are seated on the floor. 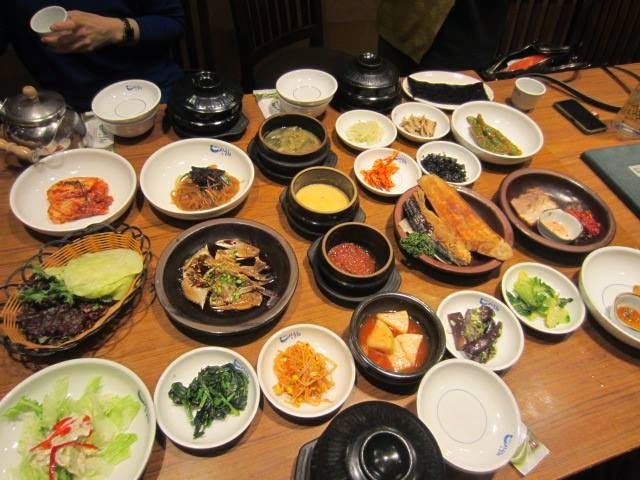 At a traditional Korean meal, the table is adorned in numerous side dishes for all guests at the table to share. These side dishes are known as a whole are called panchan. Sometimes panchan accompanies a main dish and sometimes it is served alone, tapas style. Typically, at traditional Korean restaurants, you’re seated on the floor at a low table. Comfortable for about five minutes, but the food is usually worth losing feeling in your toes. 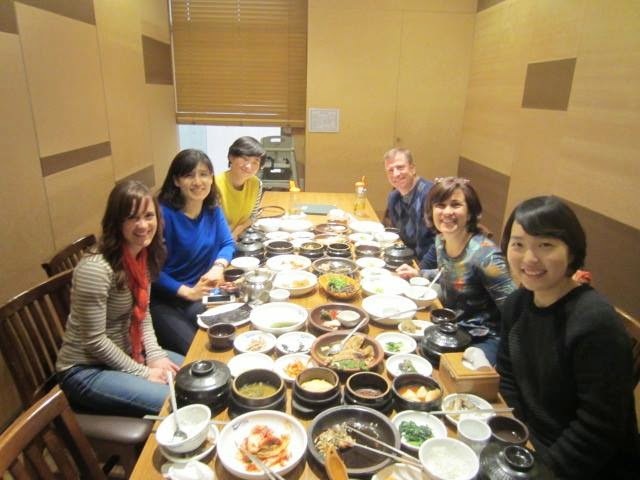 My parents and I were fortunate to sample several traditional Korean meals when we met up with Korean friends and co-workers of mine. My parents’ first time trying panchan was on the way to the lighting festival at the Garden of Morning Calm with my tour guide and friend, Harry. 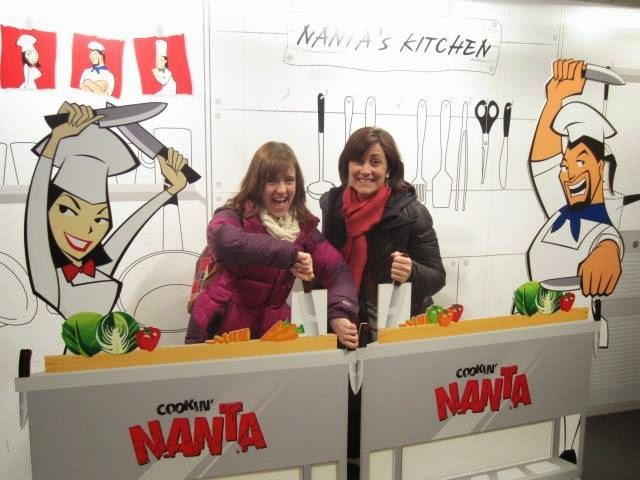 We sampled marinated pork among the side dishes and then embodied Christmas in February. Left: seven panchan that will accompany our main dish of marinated pork. Right: the beautiful lights decorating the Garden of Morning Calm in wintertime made us feel like it was Christmas. My landlord and “Korean mother” took us to a very upscale panchan restaurant. 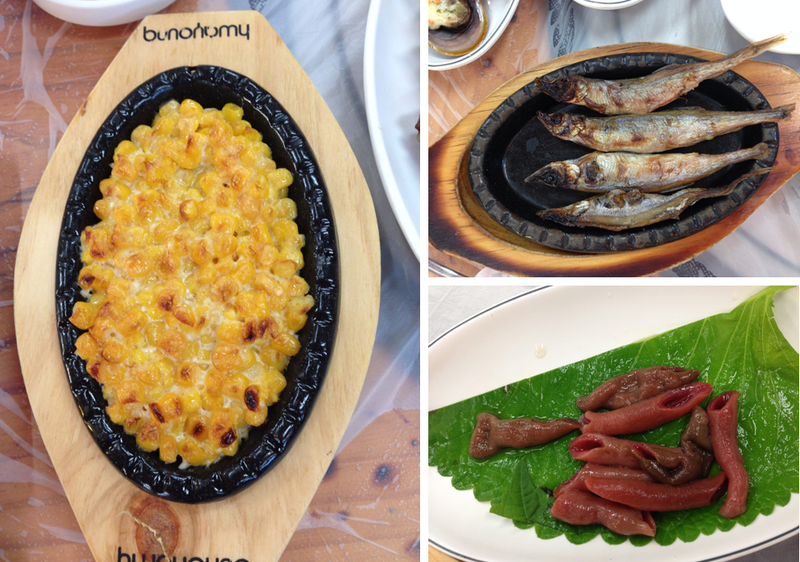 The dishes were less traditional, and more fancy and impressive. We even received parting gifts from the restaurant owner: pretty cooking spoons. We were sitting on the floor, but this place was very upscale. Our aching legs welcomed a modernized panchan restaurant where we were seated in chairs at a table with my English co-teachers and program coordinator. The number of side dishes at our table would have taken a server ages to unload, but this place had an ingenious delivering method: a tabletop full of panchan was wheeled in by a car and placed on top of our empty table. This tabletop of food was rolled in by a cart over our existing table. 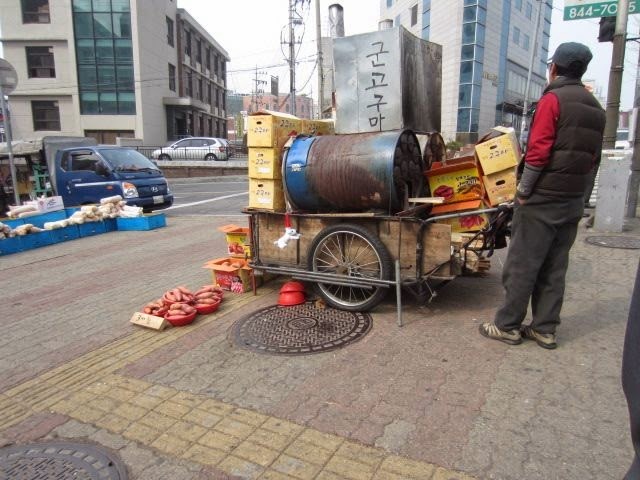 A street cart filled with traditional Korean snacks. I lived in New York City for two years and never once ate anything from a street cart. I can’t say that street food is high on anyone’s list when traveling (unless it’s a food truck; God bless food trucks), but in Seoul, you’d be a fool to miss the variety of delicious snacks sold cheaply at tiny carts around the city. 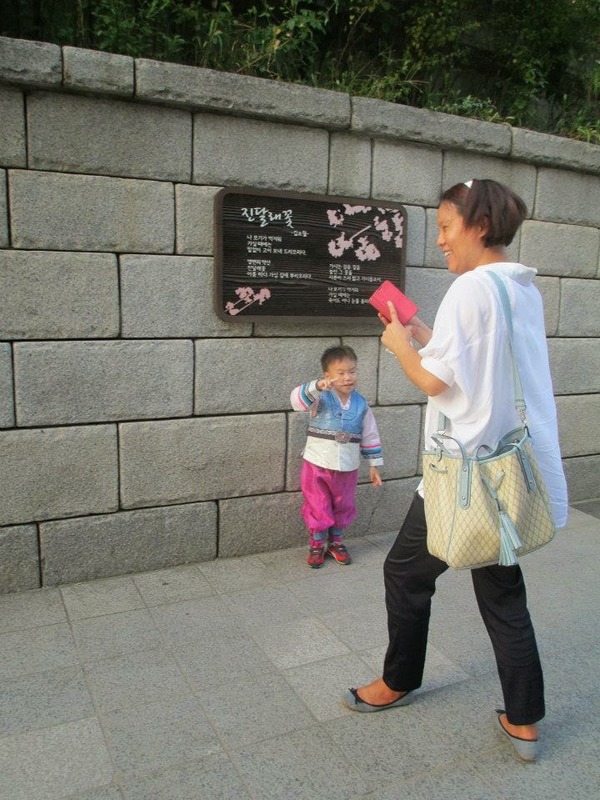 In the touristy area of Insadong, my parents and I had our fill. 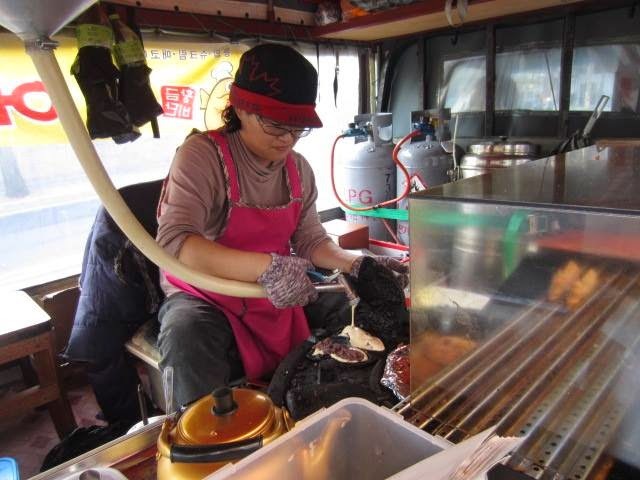 This man bakes sweet potatoes to order at his street-made setup. Filling fish-shaped pancakes with red bean paste. It’s exactly what it looks like: “dung bread.” Don’t worry, only the shape gives the treat its name. Sweet red beans are wrapped in the fried dough. 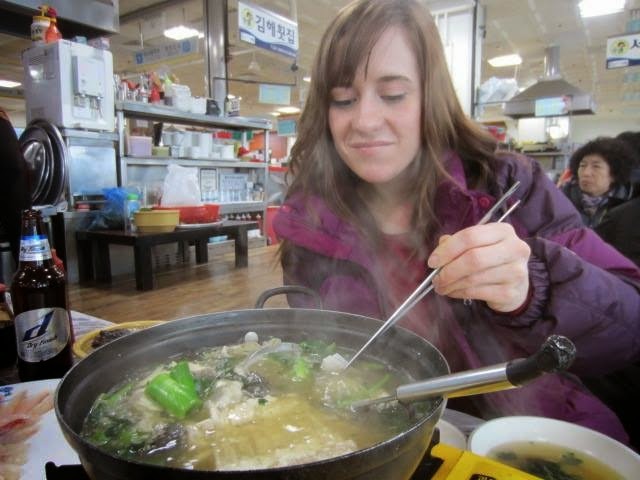 My favorite wintertime specialty: hoddeok. It’s a crispy and chewy doughnut on the outside, with a gooey syrup made from brown sugar and nuts on the inside. Served hot off the fryer! After a long day of wandering around downtown Seoul, my parents and I ended up in Myeongdong, a popular shopping area of Seoul among young people. We stumbled upon a Japanese sushi restaurant–the kind where the plates rotate on conveyor belts for you to choose from your table. 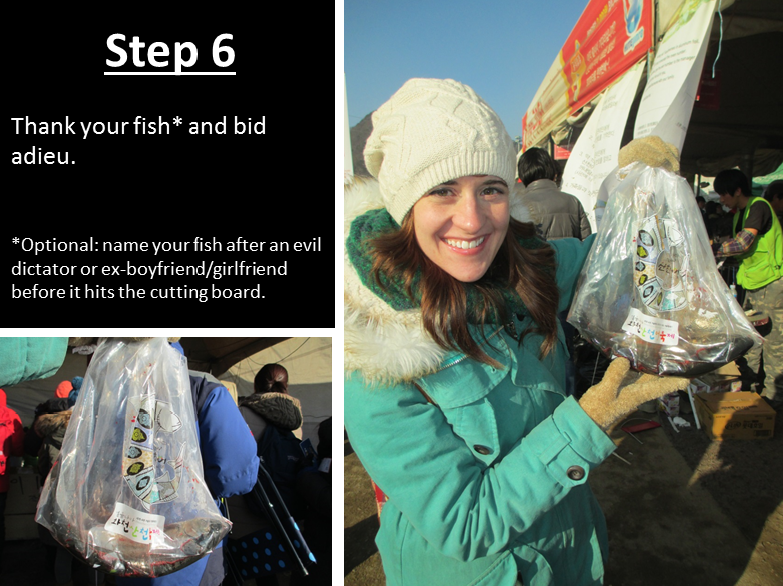 While the sushi itself is nothing to rave about, our surprise fish sacrifice was unforgettable. The unsuspecting guests (notice the conveyor belts surrounding the open kitchen in the background). The tables of the restaurant were positioned around the open kitchen so we could watch as the chefs prepare the ingredients and present them beautifully before placing on the conveyor belt. Behind the chefs were tanks of giant fish we assumed they kept for our viewing pleasure, just a small reminder of where our food came from. We were about to get an augmented reality check. Midway through our meal, one chef started yelling something until all the other chefs joined in. Then, this small Korean man reached into the tank and grabbed a three-foot tuna fish. He either lost his grip, or purposefully threw the thing to the ground where it loudly flopped around for a good 30 seconds while the other chefs prepared the cutting board. The chef then cradled the tuna in his arms and paraded the struggling fish around the restaurant while the whole kitchen chanted what I can only guess was a sacrificial prayer. 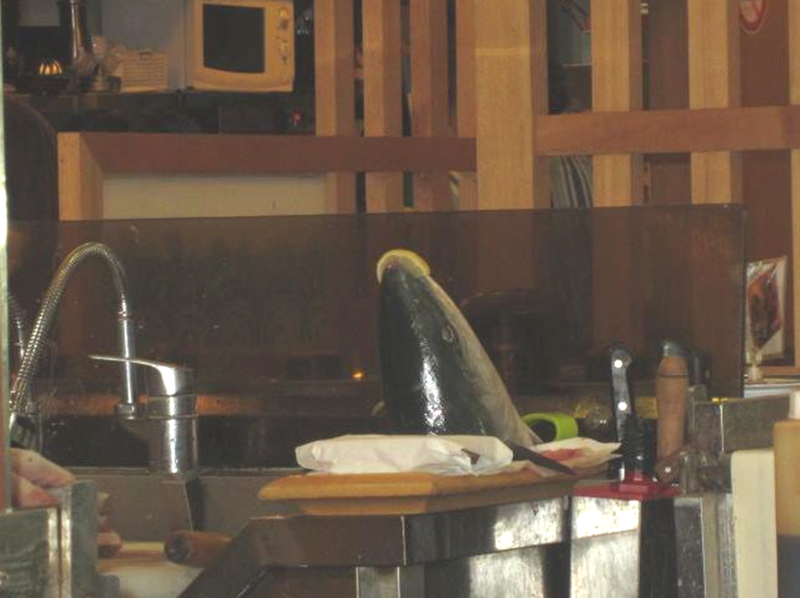 I couldn’t help but look away as I heard the giant fish slapped on the cutting board and a quick chop of the knife followed by applause. It didn’t end there. The fish’s head was then situated on a platter, a lemon slice was placed in his still-gasping-for-air mouth, and then the head was displayed at the front of the restaurant for all to see. The whole episode was probably less than five minutes, but we were so stunned, possibly a little traumatized. We were speechless until we did the only thing we could do: laugh. A severed fish head is always better with a lemon on top. Cheesy photo opportunity at the show. 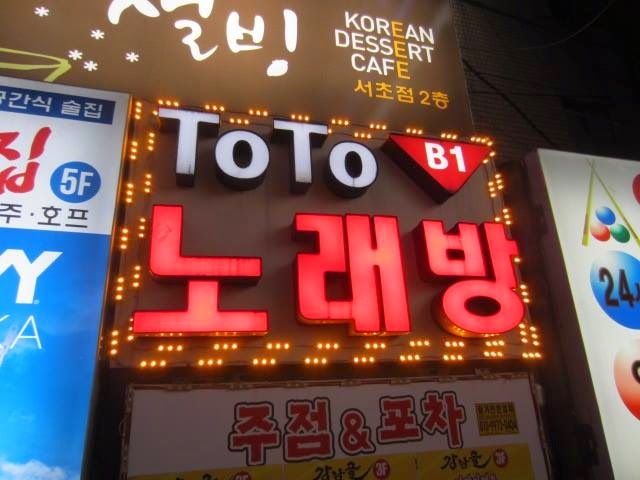 When I heard there was a Korean performance that combined music and cooking, I wanted to be first on the list. It was an entertaining production set in a small theater. 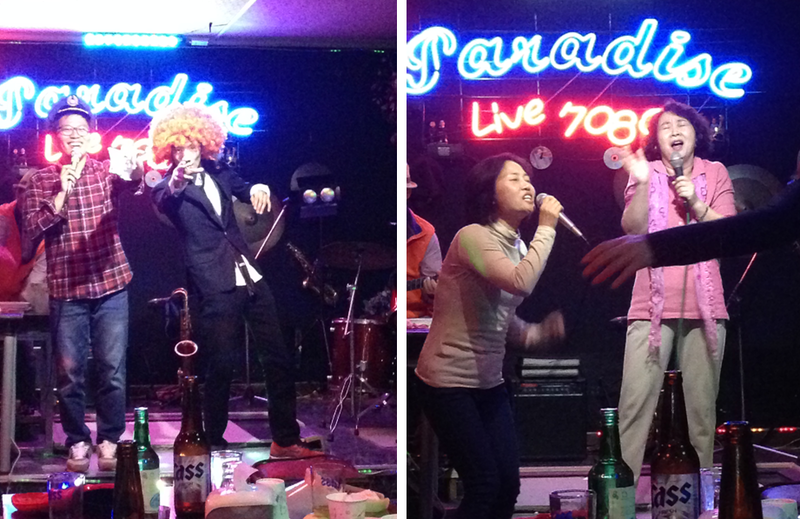 The show was non-verbal using only music, gestures, and some Korean gibberish, so language barriers weren’t an issue. 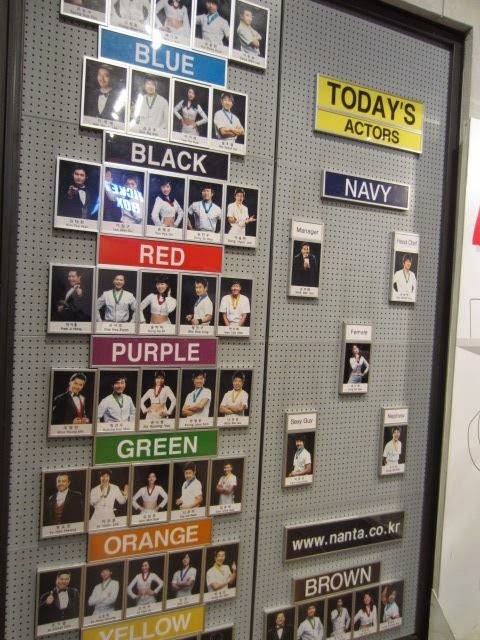 Even though there were very few words, they still told a story through song, martial arts, and cooking – on stage! The show’s actors are on a rotating schedule. Here’s the gist of the play: The boss of a very classy restaurant offers his adorable, but unqualified, nephew a job in the kitchen with highly skilled chefs. That very evening, at 5:00 exactly, is an important dinner that the kitchen must prepare for. As you can imagine, having a complete novice among professionals on such a stressful day causes some hilarious mishaps and fun entertainment. The chefs use their cooking utensils as musical instruments and the choreography is meant to mimic the teamwork of a successful kitchen. The unique blend of rhythm and cooking aromas kept me engaged throughout. We thoroughly enjoyed ourselves. A museum’s hanbok cultural program. 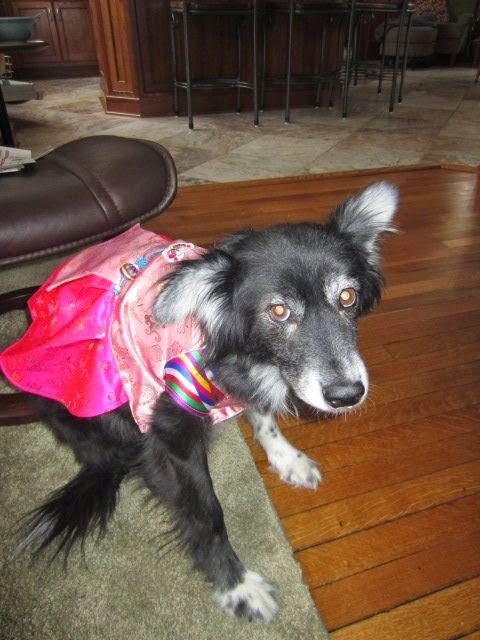 Traditional Korean clothing, known as hanbok, is vibrant and elegant. While old-fashioned it is still sold in various markets (at a hefty price), custom tailored, and worn at special events and holidays. Even in the modern day and in my short time in Korea, I’ve seen hanbok numerous times, in shop windows, during traditional performances, or just on the street around a national holiday. Many palaces and museums offer cultural programs that allow visitors a chance to don the beautiful clothing and parade around the grounds as royalty. 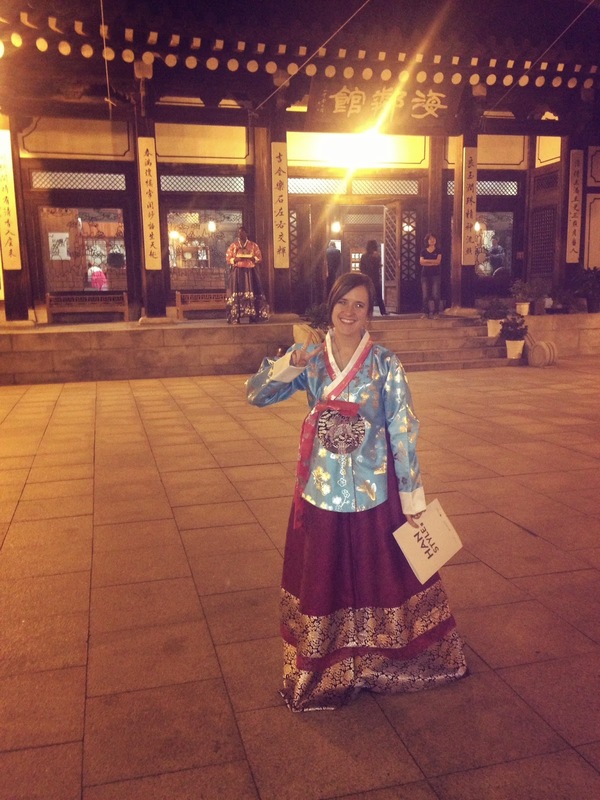 Hanbok is a staple in Korean culture, today and the ancient past. 壽(Life), 福(Luck), 富(Wealth), 貴(Nobility), Korean people believed the little bag brought the holder good fortune. Made of the same silky material and bright colors, the small “luck pockets” closely resembled the carrier’s outfit so was also quite fashionable. Today, bokjumeoni is used most often as a gift bag to bequeath small presents of candy or money to friends and relatives. Sometimes, children write down their wish on a piece of paper and put the slip inside the bag to make their wish come true. It’s a similar idea to children writing letters to Santa Claus. This semester, one of my fourth grade lessons was learning the phrase, “I want _______.” My Korean co-teacher introduced the idea of bokjumeoni to me and we thought it would be a great theme for the lesson. We finished up the chapter with an art project. 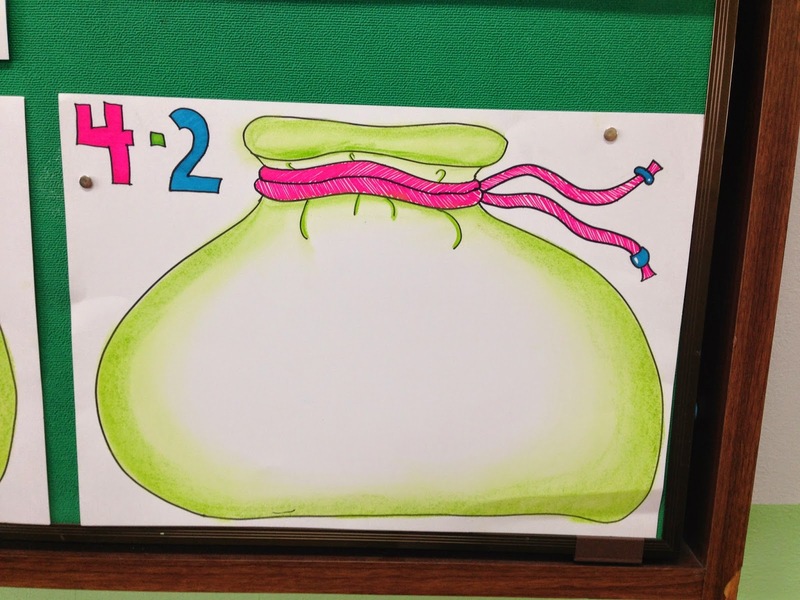 Students could write down and decorate their wishes and glue it inside the “lucky bag” picture to make it come true. 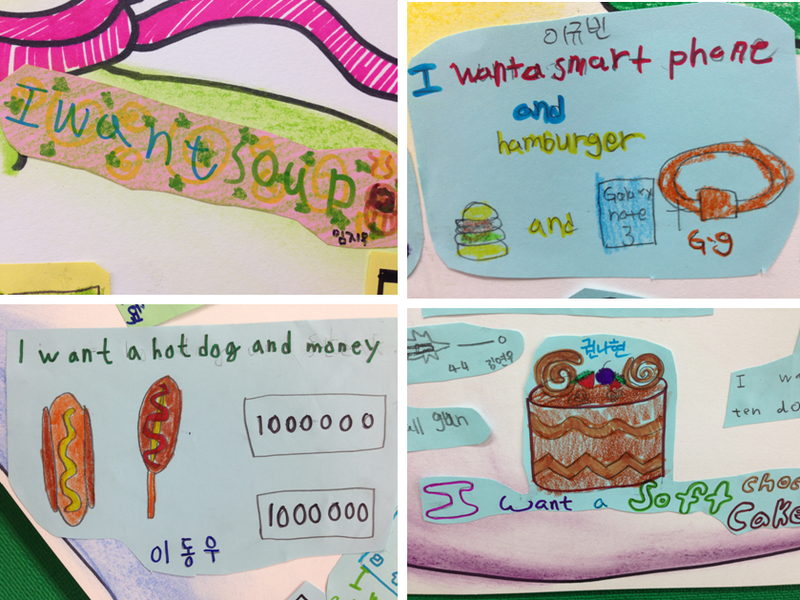 It was a really fun activity and interesting to see the desires of Korean fourth graders. Since money is a traditional gift given using the bokjumeoni, money and gold was definitely a front runner in many students’ work. In the technologically advancing society of Seoul, it was no surprise the number of Smartphone wishes being made. Since our classes are almost always in the morning before lunch, it was obvious which students’ stomachs were growling. 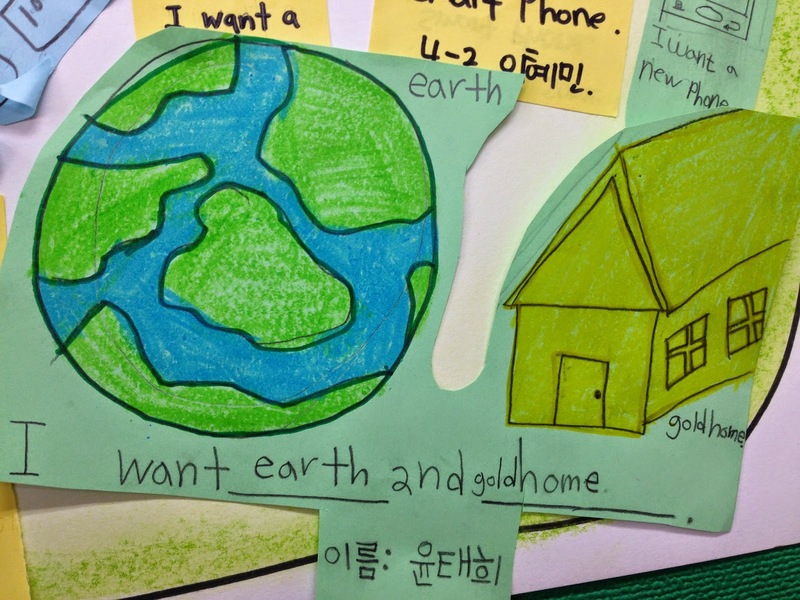 While many Korean students like to stick to the teacher’s examples or copy their friends’ works, a handful of students use art projects to delve into their creativity and ask the teacher for new English words. And then there’s the one student who wants it all. The project was really fun for both teacher and students. Fingers crossed their dreams come true and they always remember their dear American English teacher when they’re blessed with millions of dollars and never-ending chocolate. 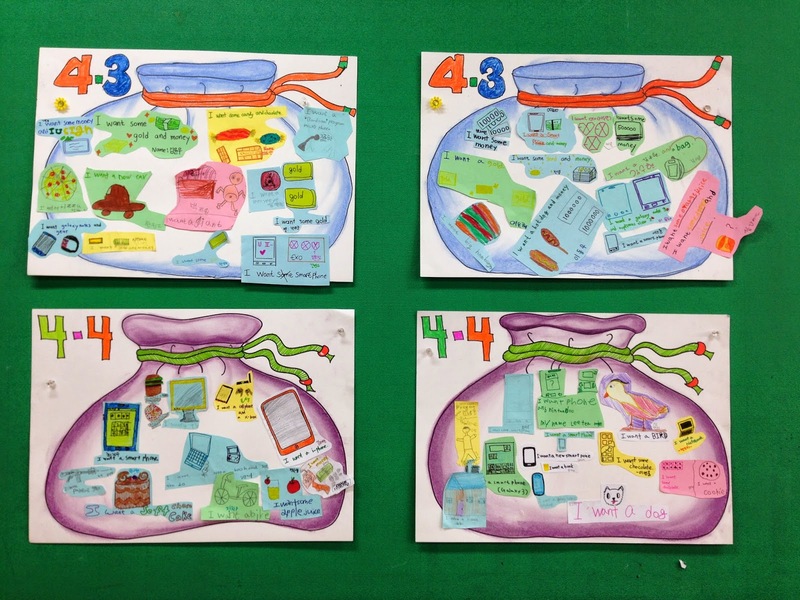 The “lucky bags” full of students’ wishes. 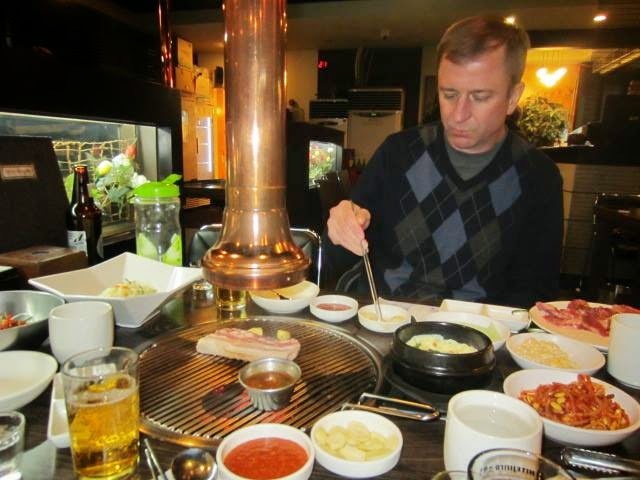 My school’s principal is a social man who loves his Korean alcohol. Scheduled about once a month, staff dinners are a morale and team spirit booster. 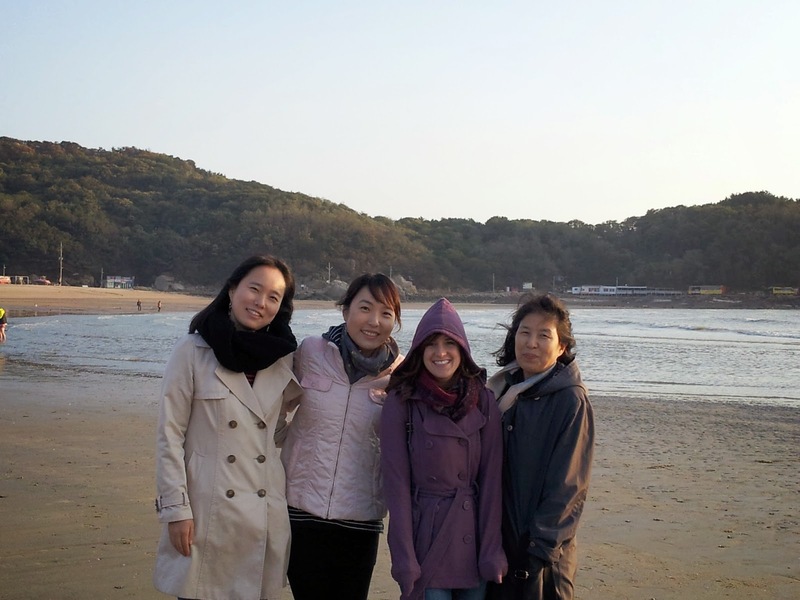 To celebrate the start of the new semester, I traveled with my new colleagues to the coastal city of Incheon, about an hour west of Seoul. In rare form, this dinner included an overnight in a pension on the beach. This dinner was not for the faint of heart. Looking back on it, I feel like I participated in a sporting event, some of the games being competitive eating, karaoke singing, and late-night drinking. In that case, I’m going to recap it as the spectacle it was. The games were off to a windy start with pictures on the beach. The players were unfazed, however, and all smiles and poses in the sand. Left: A few of the team’s subject teachers; Right: Two English co-teachers strike a winning pose for the team. As the sun set, the temperature took a turn for the worse. Many players seemed unprepared for the change and a drop in performance was noticed. A timeout was called and the team huddled together against the wind to plan for the next move. The huddle broke when the play “Group Picture” was put into action, a bold decision by the team’s captains with more than 30 players and a 40-degree wind chill, but they implemented the play flawlessly, just in time for the end of Round 1. The Moondeok Elementary School team. The players assembled formation around the seaside restaurant tables in typical floor-seating fashion. Drinks of Korean beer and liquor were distributed and the team’s MVP (most valued principal) gave the toast to signal the start of Round 2. An endless supply of beer and soju occupied its own table next to the team’s. The players had their work cut out for them with the amount of food served. The guest American player was in unfamiliar territory with very little training and the game was continuing at an alarmingly quick and steady pace. Clockwise from top left: “sea snails”; sea urchin; raw white fish; brown rice cooked in bamboo; prawns. Within the first half of the round, the players encountered a surprise game changer: live octopus. It seemed bleak for the American, but she bravely took one for the team (of America, that is) and successfully swallowed a wiggling tentacle. With warm alcohol buzzes and little time to spare in the second round, another challenge was introduced: the final dinner course. The soup’s spiciness and players’ full stomachs could have cost the team mega points, but the copious amounts of alcohol seemed to be encouraging bonus food consumption, and the rice helped keep the spice at bay. The bowls were empty by the end of Round 2. The final course of spicy soup on the left; to the right, the post-dinner damage. A few minor injuries were reported at the end of Round 2, but the team’s medic was called in and prescribed the recommended doses of post-dinner coffees during transport to the karaoke arena. They were going to need the caffeine boost for the fight that followed. Left: Some caffeinated players; Right: the two English-teaching teammates. 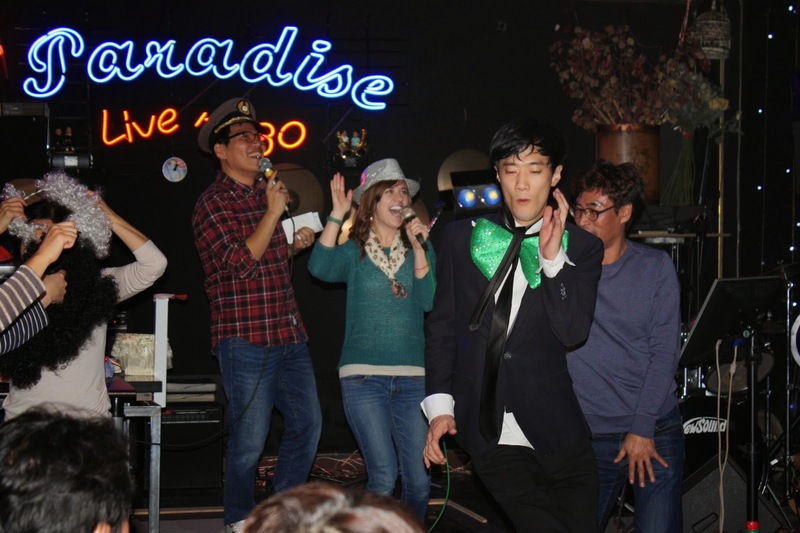 Korean pop songs continued the game. Per staggering request the American performed a mediocre rendition of “Moves Like Jagger”, but her score was enough to keep the Koreans in play. Singing the only English song of the night: “Moves Like Jagger” by Maroon 5. Plenty of debauchery ensued throughout the round including the team’s MVP donning an orange costume wig and prosthetic buttocks for the remainder of play. A risky move, but according to the judges, the best play of the night. The team’s MVP making a risky, yet successful, play. Left: Moondeok Team’s agents and spokespersons; Right: the subject teachers’ head coach and the MVVP (most valued vice principal) showed off their veteran experience. Round 3 was long and physically demanding, but the team’s morale stayed high with much encouragement from the players. All teammates contributed their share to the entertainment, but it was obvious who the star players were. Round 3 finished with a celebratory huddle and traditional Korean ballad. 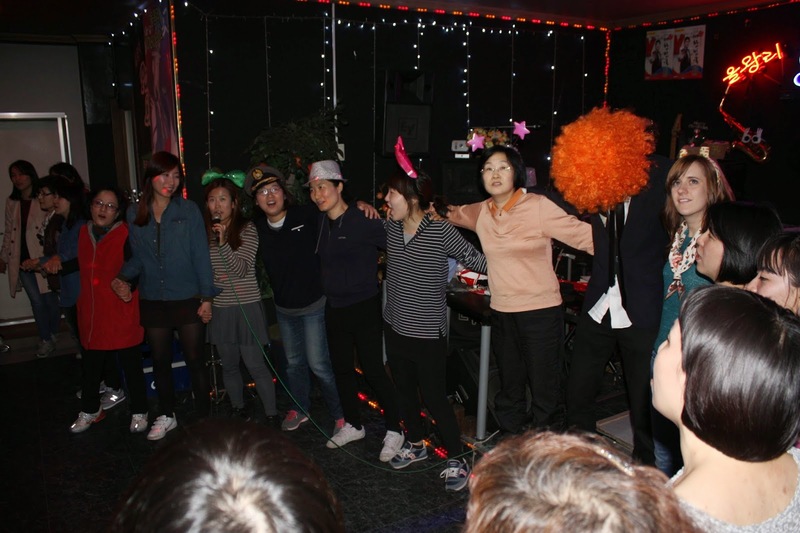 Singing a traditional Korean ballad to round up the karaoke event. After an endearing end to the third round, Round 4 began on a high. The team headed back to Round 1’s seaside restaurant for the night’s final feast. Clams of various sizes were placed on the grill and the players’ patience was put to the test as the slow heat causes the shells to pop open when ready to eat. 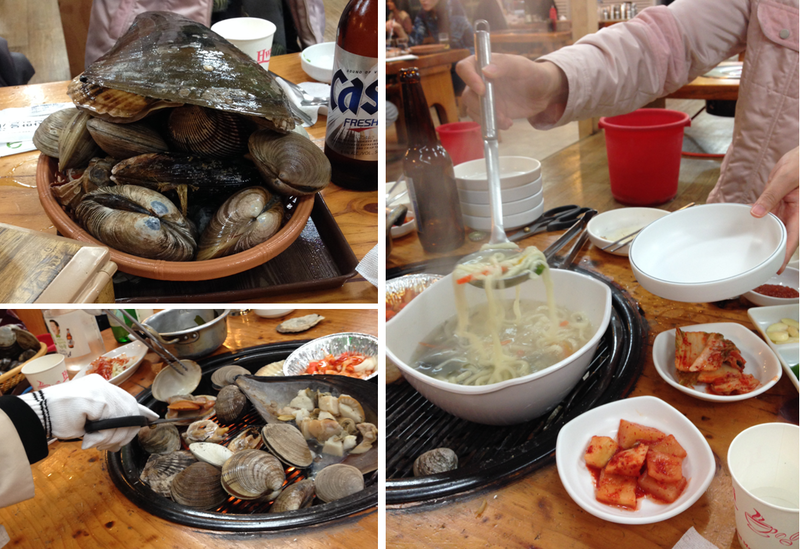 To keep from any false starts, the team ordered noodles while the clams cooked; a real game-saver. The teammates ate seashells by the seashore. If the players were still stuffed from Round 2, they showed no sign as every morsel of seafood was quickly devoured. With time to spare and a foreseeable win, the team finally slowed their pace and began their game-ending rituals: handshakes and bows for a game well done. Although the game was deemed complete, the majority of teammates opted for an optional Overtime to receive bonus points. The team split up by designated pension rooms and bought wine and snacks to contribute to the game’s largest point pool: food and alcohol consumption. Over their light midnight meal, the players discussed the night’s game and the whole team was awarded a record-breaking staff dinner score, at least in the American’s books. As the year 2013 comes to a close, it’s the perfect time to reflect on all of its happenings. And for Who Eats Better? it’s a mouthwatering time to graze over the most delicious, most terrifying, and most interesting topics of 2013. 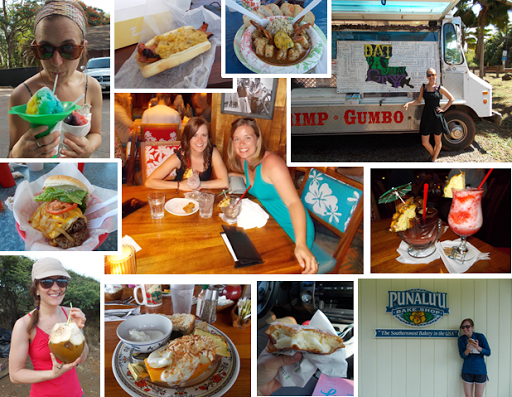 Here are my Top 10 Tasty Adventures in 2013: remember the episodes previously aired on Who Eats Better? and enjoy several new experiences and photos never before posted! I have always been a huge movie buff; this year I got really into baking. Combine the two pleasures and you will find many treats inspired by Hollywood. 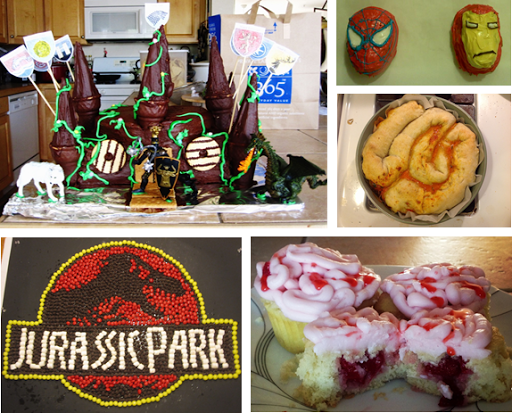 Clockwise from top left: The Game of Thrones birthday cake, Spiderman and Iron Man cupcakes, The Walking Dead pastry “intestines” and “brain” cupcakes, and the Jurassic Park logo of candy. One of my very first posts inspired by my favorite food blogger, Adam Roberts of Amateur Gourmet. View the full graphic novella here. It’s hard to believe I’ve never written a specific post about Monday Night Dinner (MND) before because it was a significant tradition that spanned over more than two years of my time in Boulder, CO. Almost every Monday night in my Boulder history, the MND crew took turns hosting each other for new recipes or old favorites, but most importantly, developing some of the most memorable episodes and significant friendships of my life. While visiting my grandparents in Tucson, AZ with my youngest brother Drew, we paid a visit to a famous Mexican restaurant featured on one of my favorite shows, Man vs. Food. Mi Nidito has had its fair share of celebrities, but the reason for our trip was Bill Clinton. He visited in 1989. Being a huge fan of Mexican food, he couldn’t choose just one delicious menu item, so he ordered one of everything: bean tostado, beef taco, chile relleno, chicken enchilada, and beef tamale. That doesn’t count the unlimited supply of chips and salsa. Since that day, the restaurant has been serving Bill’s personal platter, and in June, 2013, Drew and I conquered it all. 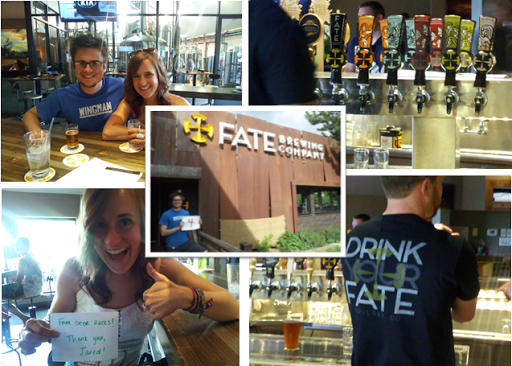 One day: nine breweries. Go! Read the full story here. This past spring I visited my best friend from college, Rachel, and her family while they were living in Hawaii. It was an amazing trip! 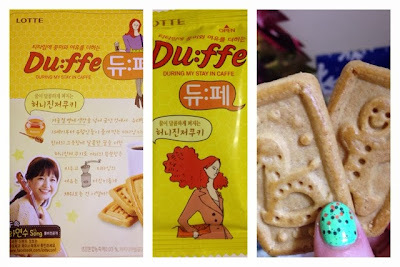 Read about my most “onolicious” foods here. My 30-day vegan challenge was one of the most stimulating parts of this blog’s year. It inspired a lot of creative writing, and the series are some of the most liked and commented on posts of WEB?. 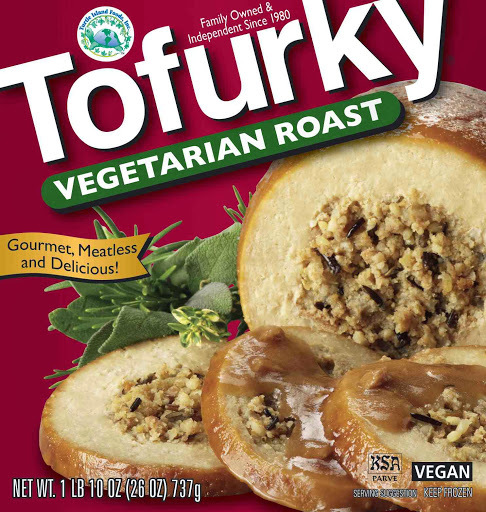 The post, “Vegan Challenge: The Dreaded Dinner Party” wins the award for Most Liked Post in 2013! “As long as you chew, it won’t get stuck.” Watch the full video of me trying live octopus here. How often do you get to meet the animal before it ends up on your plate? 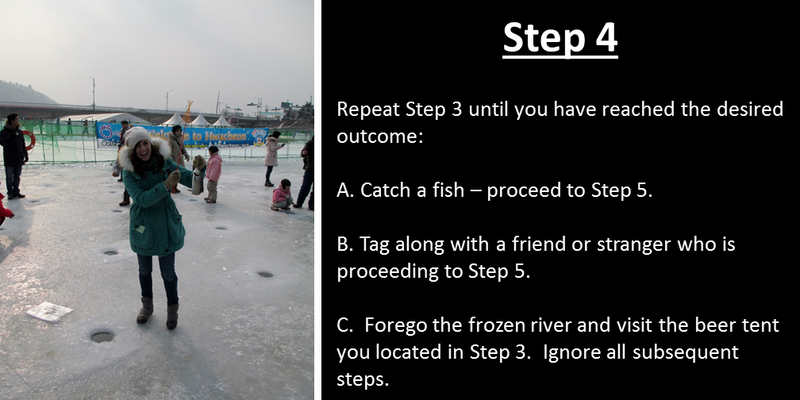 In the coastal city of Sokcho, Korea, I visited a fish market and actually chose an oblivious swimming fish to be immediately prepared and served sashimi style. I said a sacrificial prayer as the fresh meat melted in my mouth. It was an alarming and delectable experience. 1. The Inception of Who Eats Better? It seems ages ago now, but it was only this year that WEB? was born on March 8th. Maintaining a blog has proved challenging, but satisfying to the mind, and of course, the stomach! My inaugural post “When do we eat?” wins the award for Most Viewed Post in 2013. Auld lang syne, 2013, and cheers to 2014! Happy New Year! My first thought: candy canes! What is more iconic to the jolly holiday than those adorable peppermint sticks. 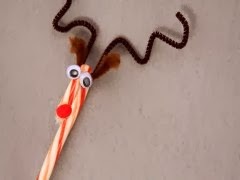 My goal was to find them aplenty and adorn them with googly eyes and pipe cleaners to resemble our red-nosed friend, Rudolph. 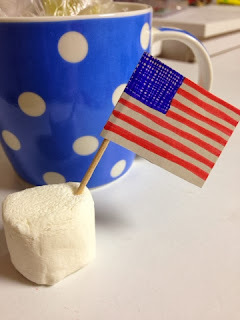 Don’t you remember making these as a kid? Or receiving one every year from your kin? In Korea, candy canes are a rare commodity, even around Christmastime. 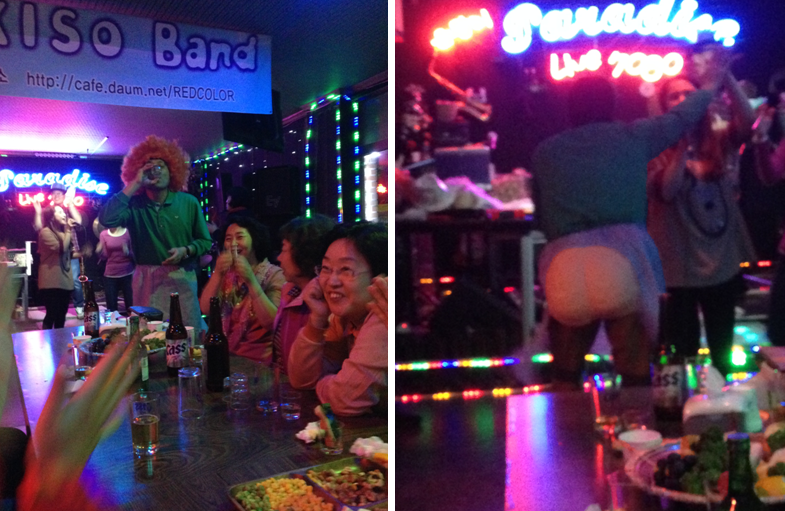 It was at this time that I learned exactly what Christmas means in Korea, according to a few local friends. Christmas is a fairly new holiday to the country and pretty much everything they’ve adopted as Christmas culture comes from the USA. Christmas cards are in English, American holiday classics are their song choices, and even the Korean translation of “Merry Christmas” is pronounced “Mae-ree-kuh-ri-se-mes-eh.” Did you hear it? Let’s return to the candy canes: my hunt was short lived. I found them at a bakery for $2 a cane and, let’s be honest, they’re not that good. It was back to the drawing board. After a much appreciated care package from the USA, I quickly remembered the three C’s of Christmas: cookies, candy, and cocktails! However, let’s keep it clean and say hot chocolate. 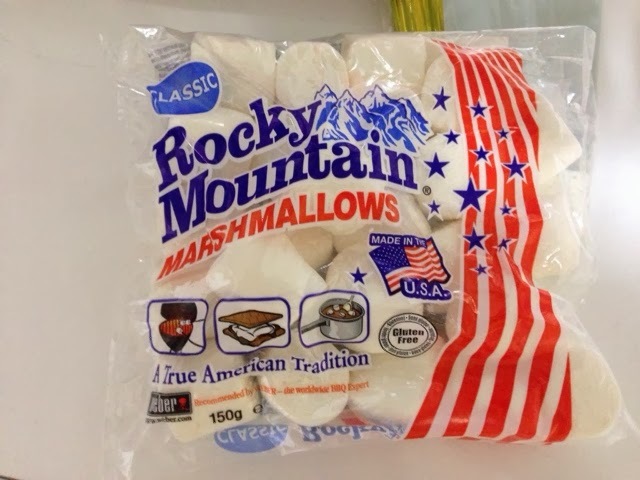 And what is more American than melting marshmallows in your hot cocoa? Like the candy canes, I was sending myself on a wild goose chase, but this time I prevailed! These might be the most American ‘mallows I’ve ever seen. These cookies, on the other hand, are less American, but the gingerbread men and other Christmas impressions still did the trick. Now, do you remember my choice of wording with an “über” traditional gift and my insinuation to its irony? Here’s where that comes in. I had two C’s left on my wish list: hot cocoa and candy. I went to a large “everything” store in Seoul called E-mart. Wal-mart’s cousin? Most likely. 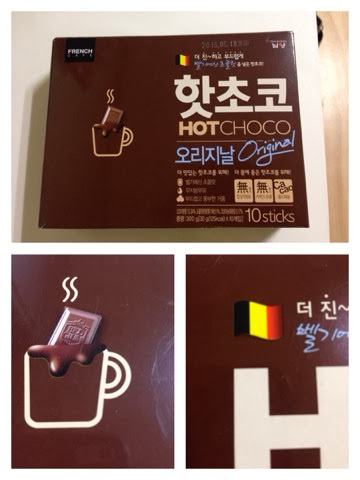 First I found this classy “hot choco” imported from Belgium. 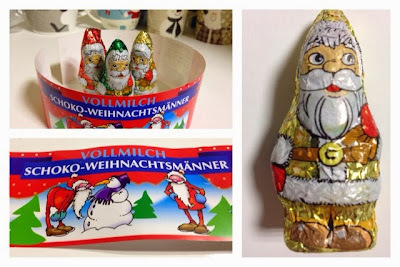 Then I snagged these jolly guys who I can only guess traveled from Germany. 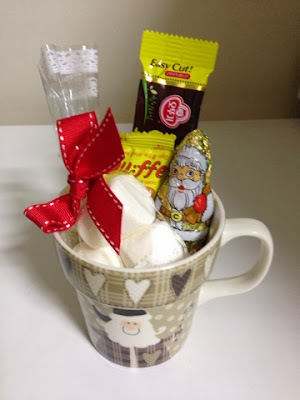 The best way to tie the whole ensemble together: a seasonal mug. As I delivered these to the various desks and offices, I labeled them as a “traditional American Christmas gift.” Little did they know (or maybe they totally knew) that only 20% of the gift could actually claim American citizenship. But hey, it’s the thought that counts. Food has always been an extremely important piece of Korean culture. 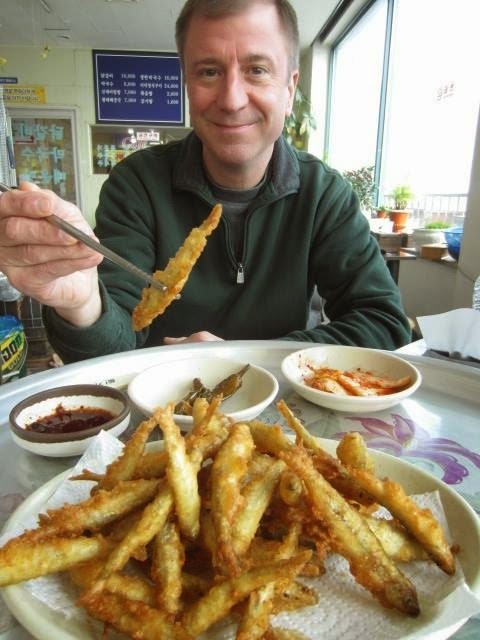 For the kings of the Joseon dynasty beginning in the 1300’s, food was as precious as gold. The royal dishes, called “sura”, were made by the most skillful cooks using only the best seasonal ingredients selected from every available source in the country. Kings usually dined on three square meals a day, each with 9-12 side dishes! Here is a replica of how a typical table appeared at mealtime in the palace. It’s good to be the king, eh? 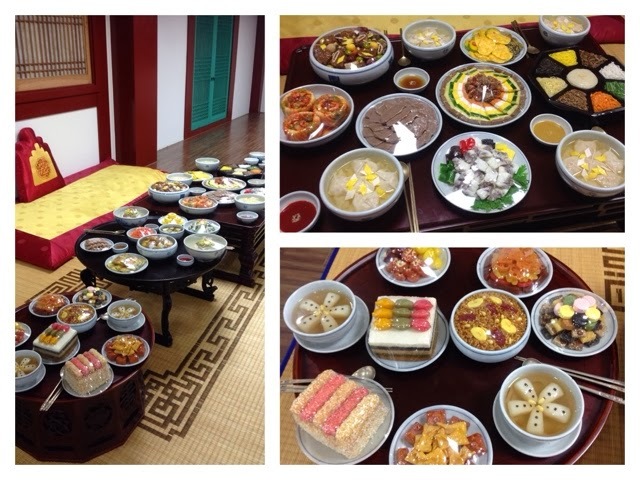 Replicas of a king’s table during the Joseon dynasty; he even got dessert! Clockwise from top left: the instructional station with a closeup view of the action on the TV; our group cooking station; the lovely recipe; Korean women frying up fish fillets. 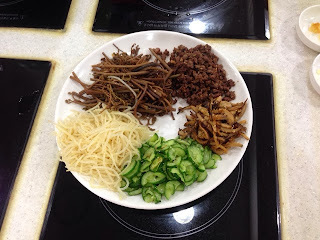 The most interesting thing about Korean dishes is the significance of all its components. 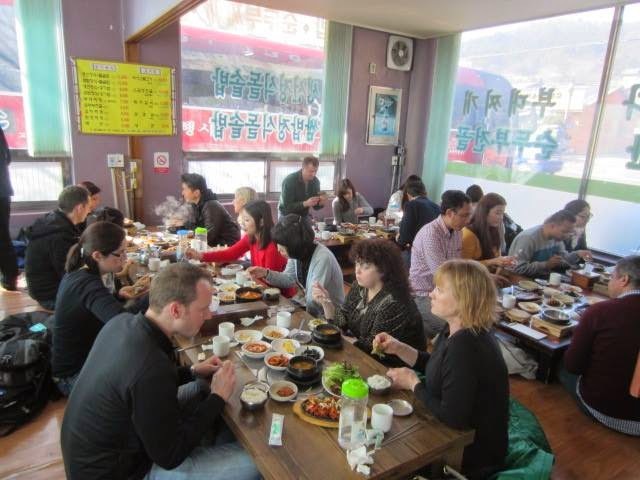 Koreans have a strong belief in the holistic power of food. Good food is the best medicine. Ancient Koreans actually believed that certain food had healing powers and could cure even the worst diseases. While not as extreme today, there are many foods that hold a distinct purpose. 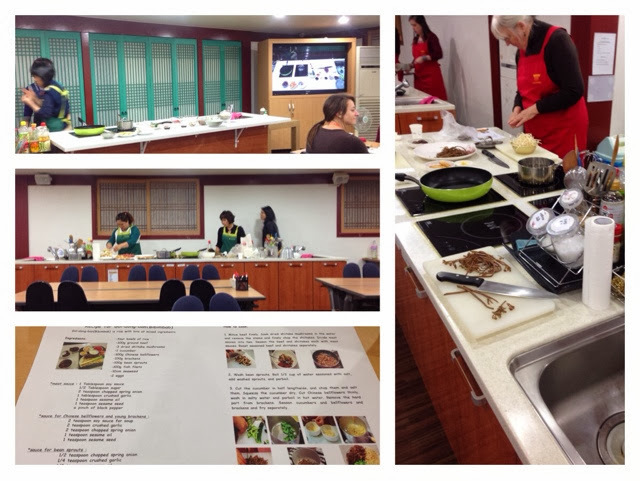 Some of our ingredients in the cooking class including shiitake mushrooms, bean sprouts, and Chinese bell flowers held the secrets to warding off cancer, relieving a hangover, and soothing a sore throat, respectively. 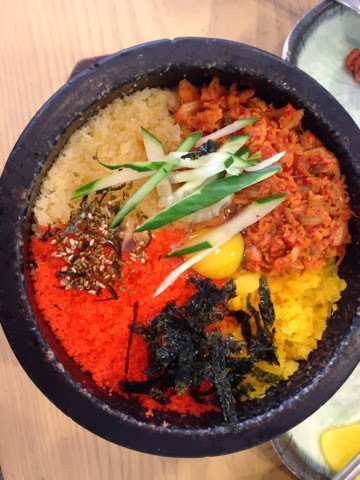 Another integral part of any Korean dish is the color. The importance of colors spawns from the belief that a person’s body is only healthy when its yin and yang are in balance with the five elements that make up the universe. Not only visually appealing, the food’s colors are these five elements’ representation: red, green, black, white and yellow. 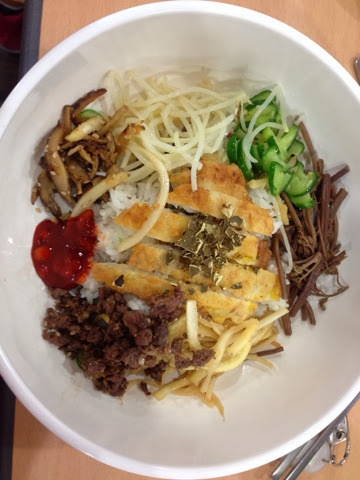 You can see in the bibimbap that we made in the class, each color is made prominent by the cucumbers (green), fern brackens (black), Chinese bell flowers (white), fried fish fillets (yellow), and red pepper paste (red). In most traditional bibimbap, the color yellow is represented with a raw egg. Cooked and served in a scorching iron bowl, the hot rice cooks the egg as you mix all the ingredients together. The presentation is almost too beautiful to eat! The cooking class was a great success. 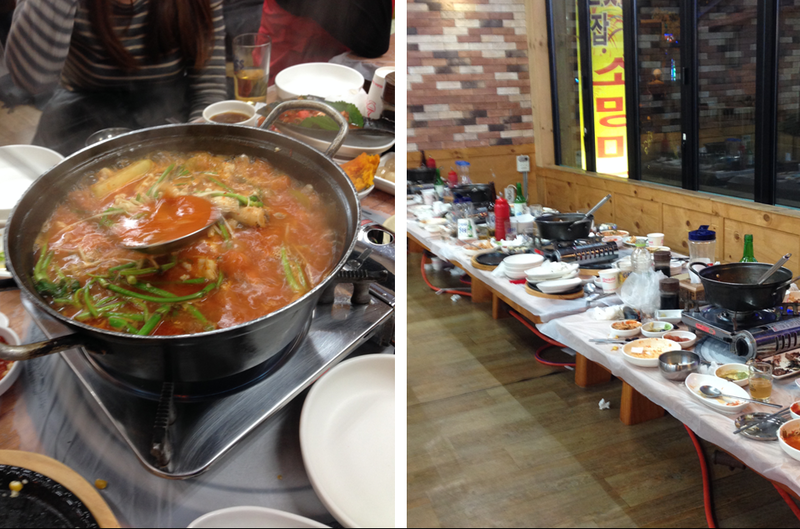 Not only did I eat some delicious food, but I learned the care and love that goes into making Korean food. 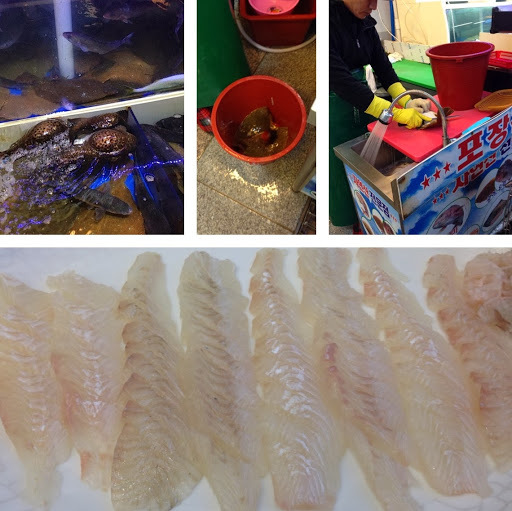 Several Korean women were frying the fish fillets as we entered and the fern brackens had been soaking in salt water for days. There are very specific techniques in cooking and preparing each ingredient, and they made sure we were doing it just so. It was quite a delicious learning experience! Here I am with my group at our cooking station. 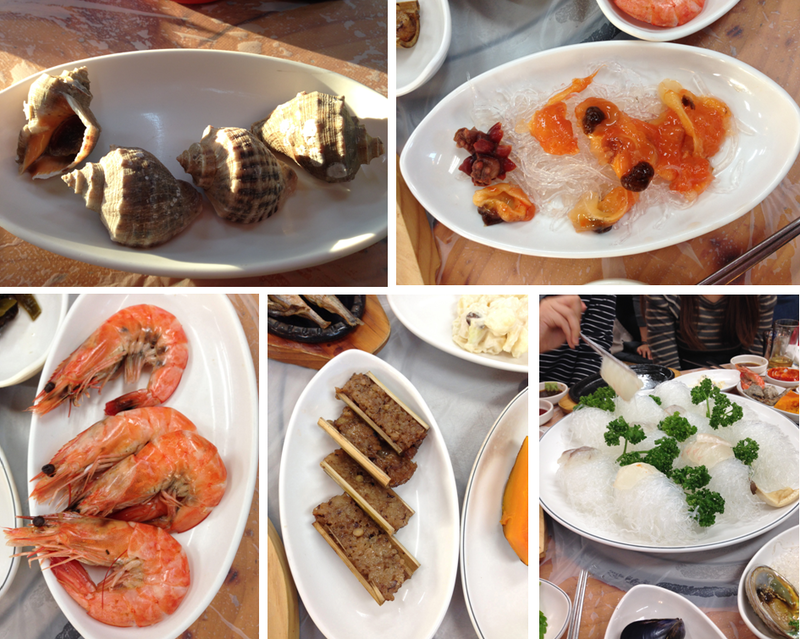 Last weekend I went out with my co-workers for a seafood dinner unlike any I’ve had before. 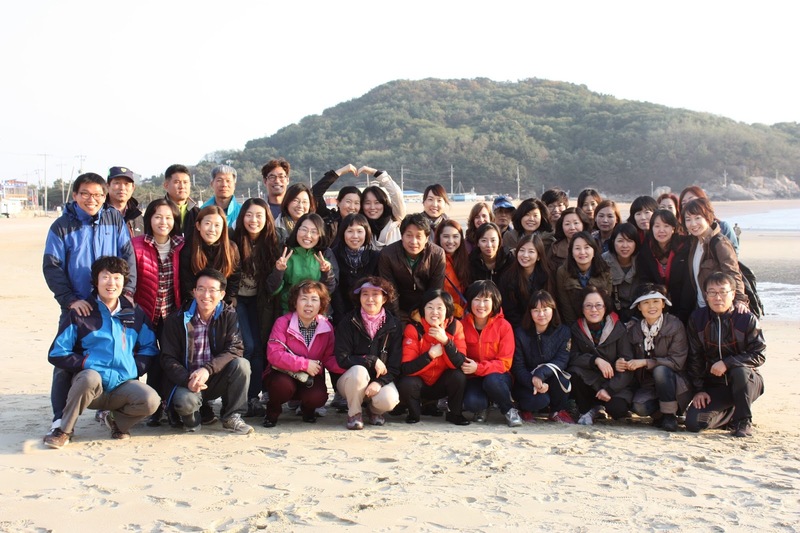 The restaurant was situated right on the beach in the city of Incheon. The ocean provided a beautiful reminder of where the food on our plates had come from, some of it seeming all too recently. I think the main attraction of the night was the squirming “sannakji” – live octopus. Technically it isn’t alive because they remove the brain, but its active body provides some unsettling entertainment: dinner and a show! Similar to a chicken continuing to run around despite its recent decapitation, it’s only “mostly dead.” The sannakji’s most infamous serving style is the full-size tentacles being wrapped, or more rather suction-cupped, around a chopstick. An even more jaw-dropping presentation: the little guy in its entirety flailing all eight tentacles in your (still hungry?) face. Thankfully the sannakji served at my table was cut into pieces, but it was still quite a shocking site.